System of Engagement - UCaaS Approach | 8x8, Inc.
As I shared in a recent blog post, customer expectations and competitive pressures are forcing companies to transform digitally. A great place to start is with your communications system. Voice still matters. Salesforce.com found that 92% of customer interactions still happen over the phone. That’s a high percentage, but it makes sense when you think about how people still prefer to talk to people. So communications is a key part of the digital transformation trend. A company can only move as fast as their communications system. And one system of engagement increases your communications speed. What do we mean by one system of engagement? One system of engagement is a term to specify how unified communications and contact center can be combined on one platform in the cloud, creating benefits such as a lower total cost of ownership, full customer journey analytics, and revenue acceleration. In “industry speak,” it’s the convergence of UCaaS (Unified Communications as a Service) and CCaaS (Contact Center as a Service) into one integrated platform instead of point cloud solutions. One system of engagement means one cloud communications platform for business phone, team messaging, meetings, and contact center. In contrast, when companies turn to buying a bunch of point cloud solutions, each one of which has very limited capabilities, employees get app fatigue. They have to download, learn and mentally manage 4+ apps just to do their jobs. Also, the data is fragmented across the different systems which inhibits analytics and insights to improve operationally. 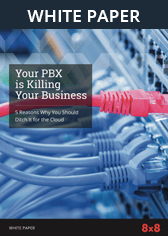 With one system of engagement in the 8x8 UCaaS/CCaaS approach, the total cost of ownership is even lower than with cobbled-together point solutions. With one system of engagement, you’re only paying for one support team and one sales team—and all the technology is owned by one company. These economies of scale get passed on to you, leading to a lower total cost of ownership. The second major benefit of one cloud versus multiple clouds (using many cloud vendors for your communications and customer experience) is that you get full customer journey analytics integrated across systems. With multiple point cloud solutions, it is not possible to track metrics such as revenue conversions across a customer’s interactions, which might include a transfer from a contact center to a retail store phone. With one cloud system of engagement, it’s possible to track metrics and conversion rates across any mode of communication, because it is all part of one set of data in one system of intelligence. Executives get very excited about using these kinds of insights to improve their companies. 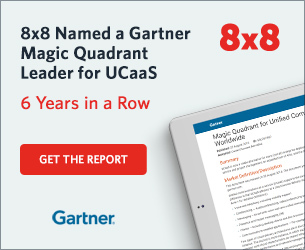 A third benefit of the 8x8 UCaaS/CCaaS strategy of one system of engagement is that employees’ productivity increases when everything is readily accessible—leading to revenue growth acceleration. Less clicks are required to move between modes of communication, and full context can be served up with every live interaction, allowing Sales to close deals faster and Support to delight customers and upsell. In addition, subject matter experts become accessible with one click, allowing the full company to contribute to answering customer and prospect requests. Instead of saying “I don’t know” to a customer, your teams should be able to answer questions and please customers. And we all know better customer satisfaction and higher NPS drives revenue and referrals. 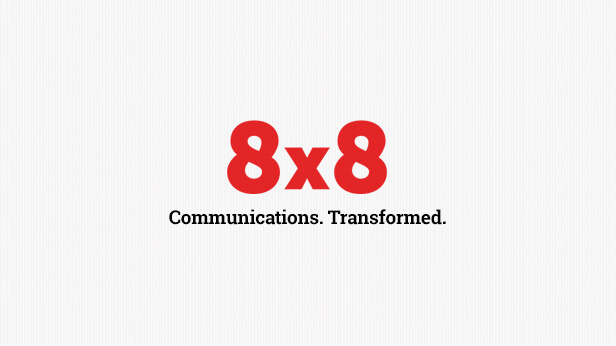 8x8 is the leading UCaaS and CCaaS provider of one system of engagement for communications and collaboration. We pioneered one cloud solution and continue to innovate to help companies transform their communications.